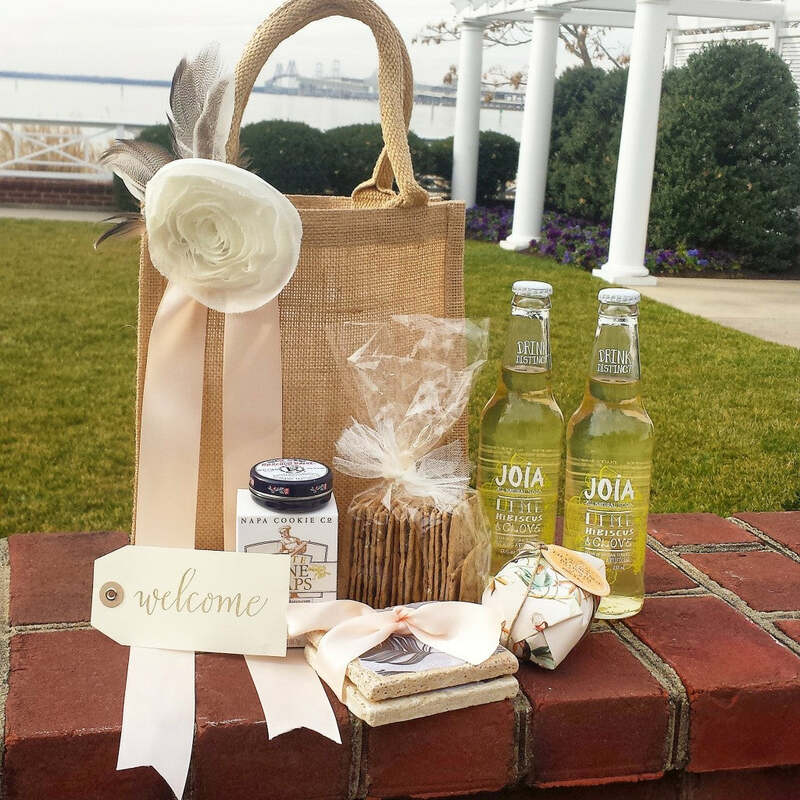 When Chesapeake Bay Beach Club contacted me over the summer to see if I wanted to consult on upscale swag bags for their annual bridal show, I said 'yes' in a millisecond. I'm so glad I did! 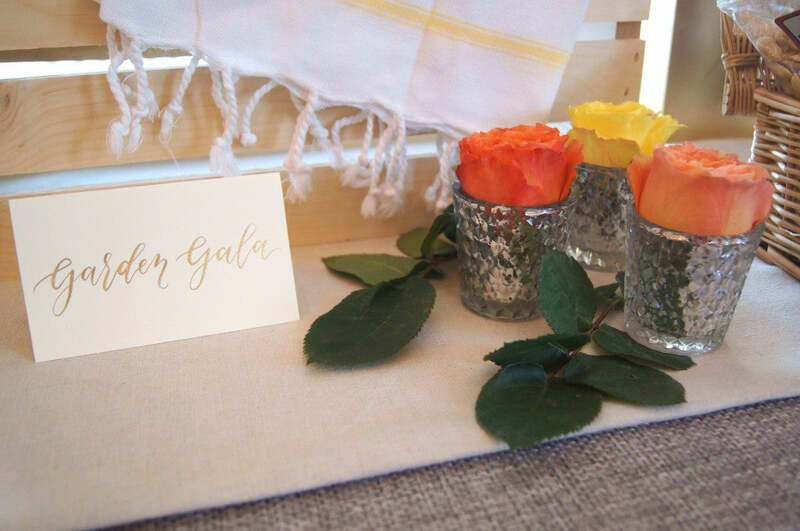 The Bowties & Bubbly event turned out to be an amazing opportunity for our little company and I'm ecstatic to share with you a recap of all the many ways we were involved. Design and assembly of 200 swag bags. 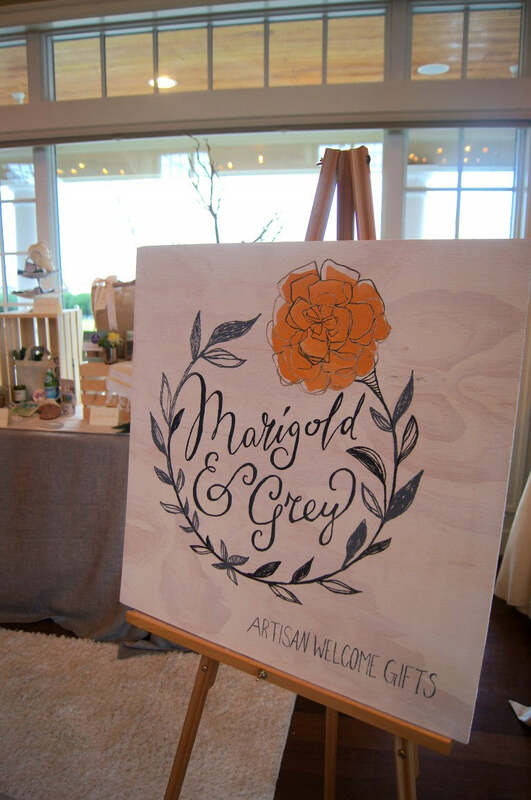 Our Marigold & Grey vendor booth. 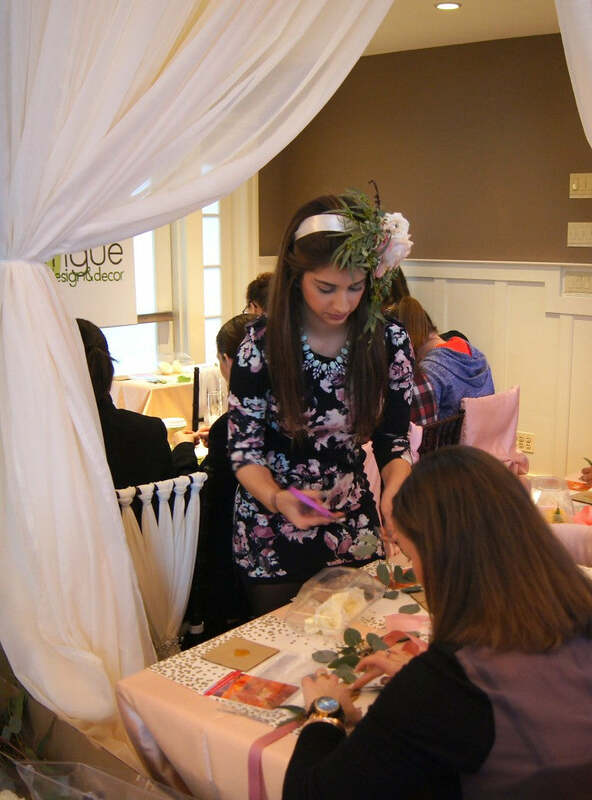 Participation in six different photoshoots alongside wedding planners and designers the day prior to the actual show. It was a whirlwind of activity, tons of work, and one of the most rewarding experiences I've had since starting Marigold & Grey! 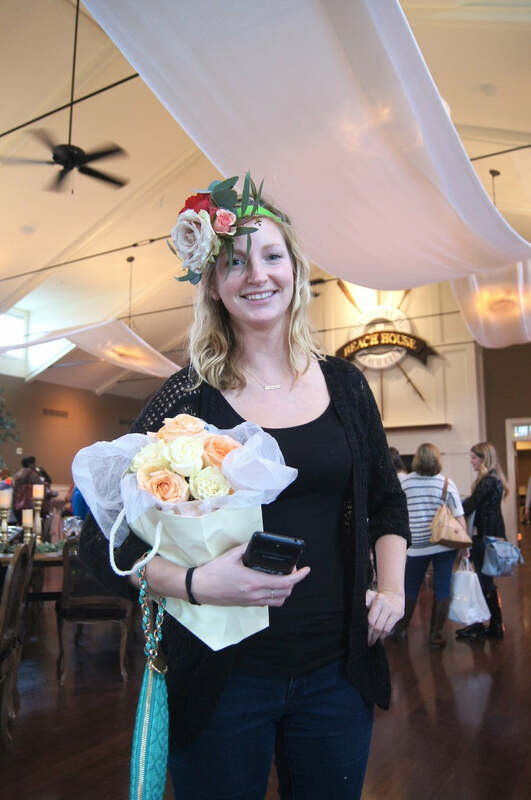 Being my first-ever bridal show, I wasn't 100% sure how to put together a booth. I remained true to the colors in my branding and overall aesthetic and happy to say, I'm pretty pleased with how it turned out. My favorite part...the handmade wooden sign created by Poppy & Scooter! She's a whiz at modern calligraphy but clearly her talents extend beyond lettering on paper goods. The sign added the perfect finishing touch to our display. 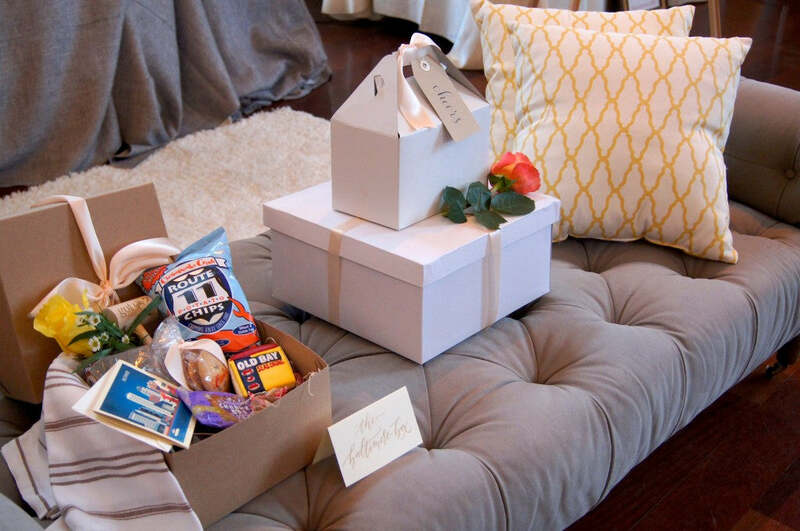 A gorgeous grey settee borrowed from the Beach Club (thanks Teresa and Erin!) plus a last-minute area rug and pillow purchase from Target and voila! We had the upscale, yet cozy, vibe I was after. 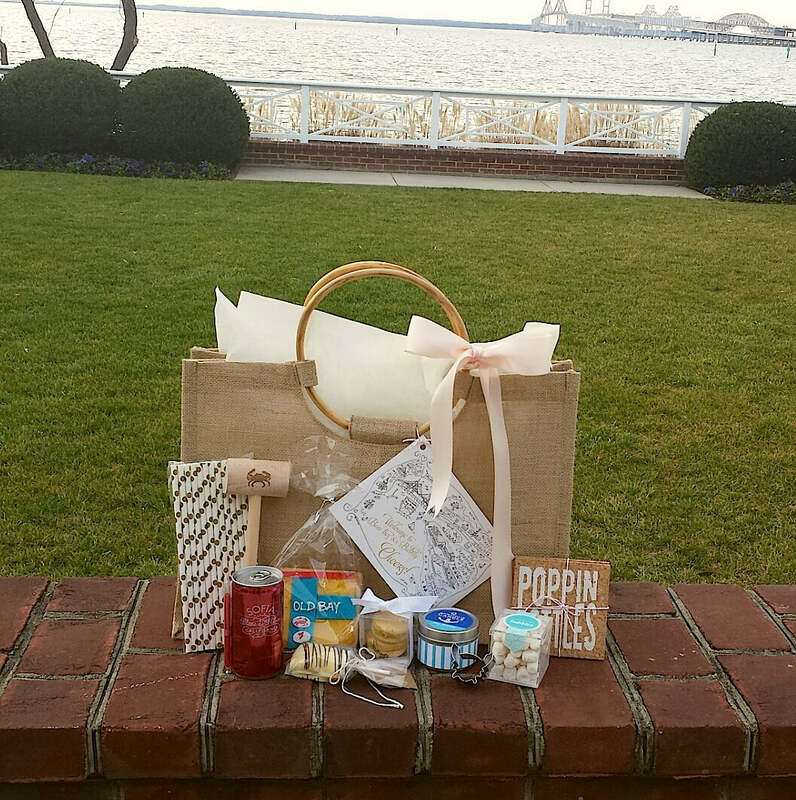 The 'Baltimore Box' was a huge hit! 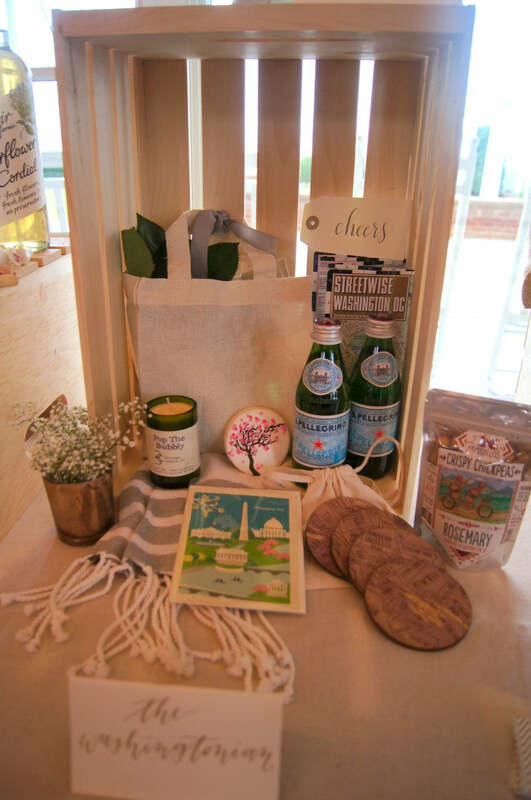 We had so much interest in the locally-inspired treats and keepsakes. Really appreciated all of the brides and their friends and family who stopped by the booth and offered such positive feedback and genuine interest. We even had a suggestion for a Natty Boh cookie and we agree...fantastic idea! We have already added it to our 2015 must-do list! 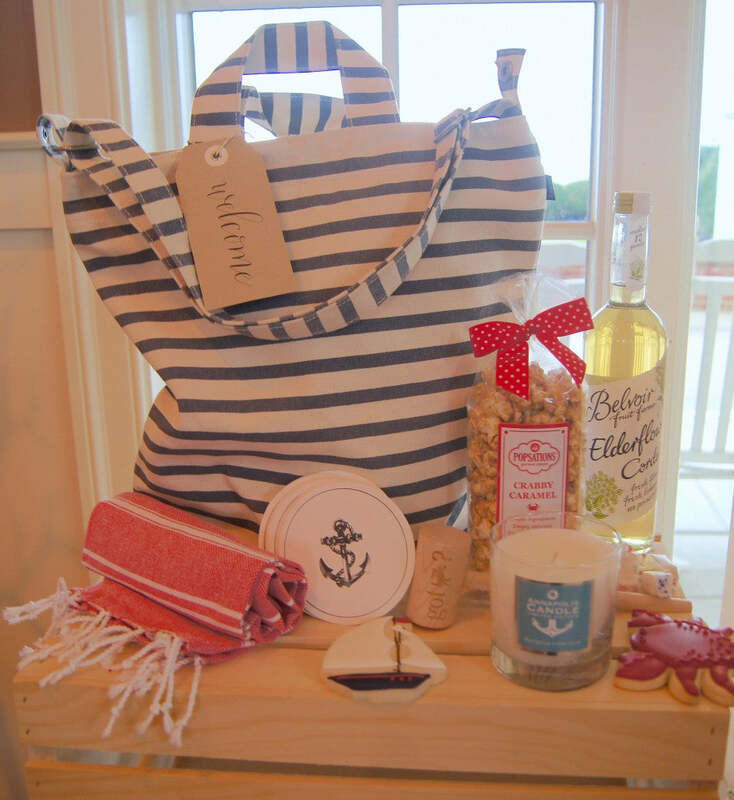 Also a lot of squeals of excitement over our beach and nautical-inspired display. 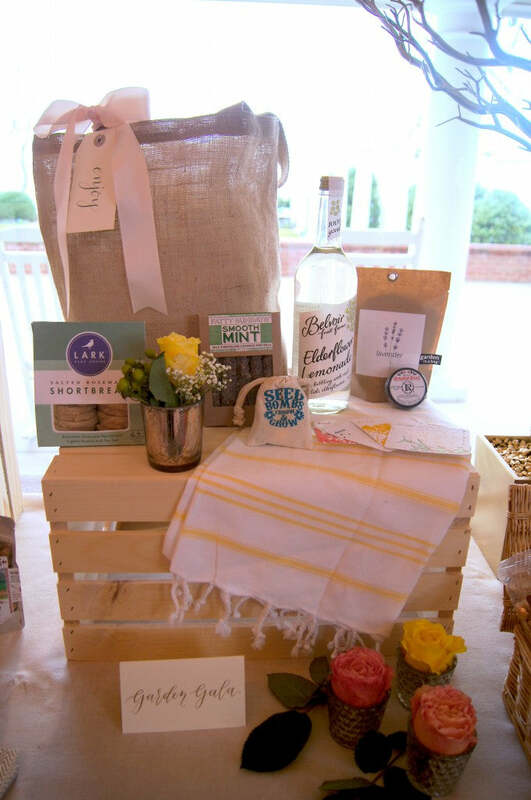 From the "Shell Yeah" coasters to the lush Turkish-T towels to the adorably-packaged Annapolis Candles, we have a feeling we'll be seeing a lot of requests from our beach-loving brides. 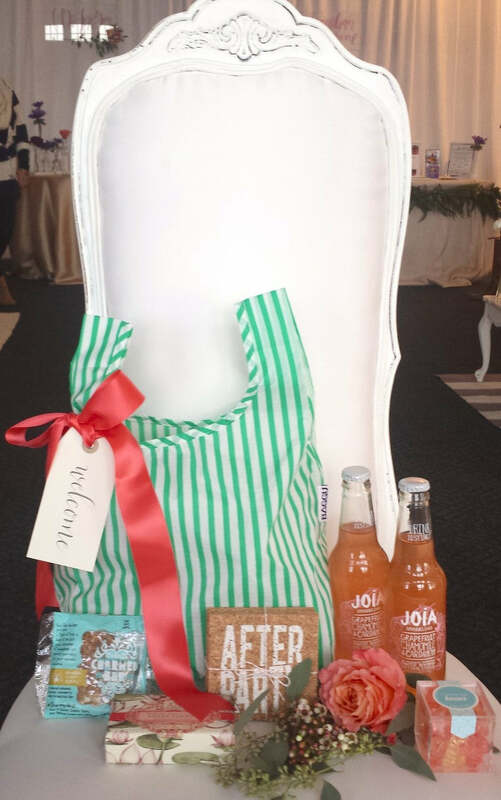 And a few other gift combinations featured in the booth to include the Washingtonian, Annapolitan, Relax & Recover, Garden Gala and Sweet Virginia. 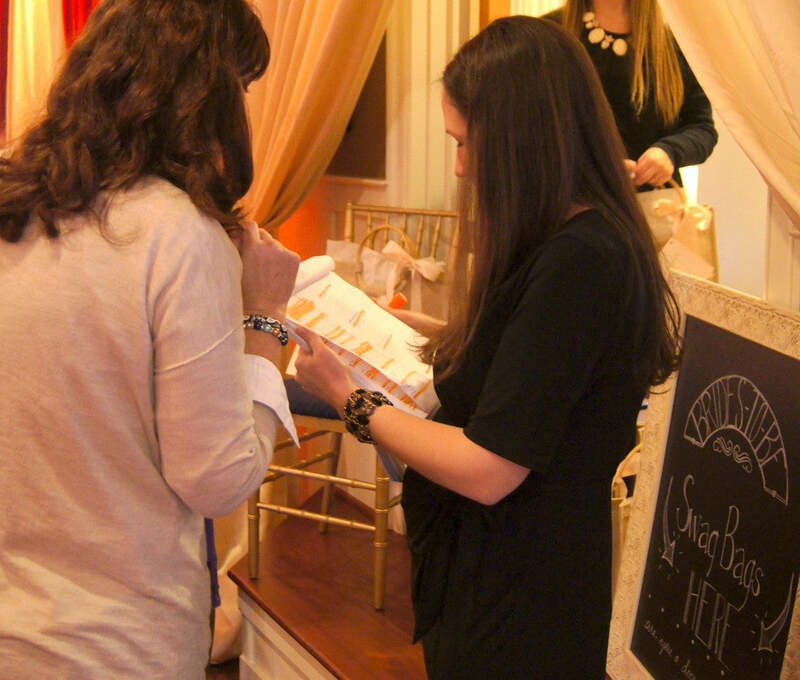 A huge 'thank you' to Jenna Shellhammer of Pop the Cork Designs who helped me with booth design as well as greeting booth visitors on the day of the show! When I kept trying to add more and more florals to the booth, she kept saying "Stop! Less is more." And yes, Jenna, you were 100% right. I probably would've put blooms on anything sitting still if I had the chance. Thank you for keeping me in line! 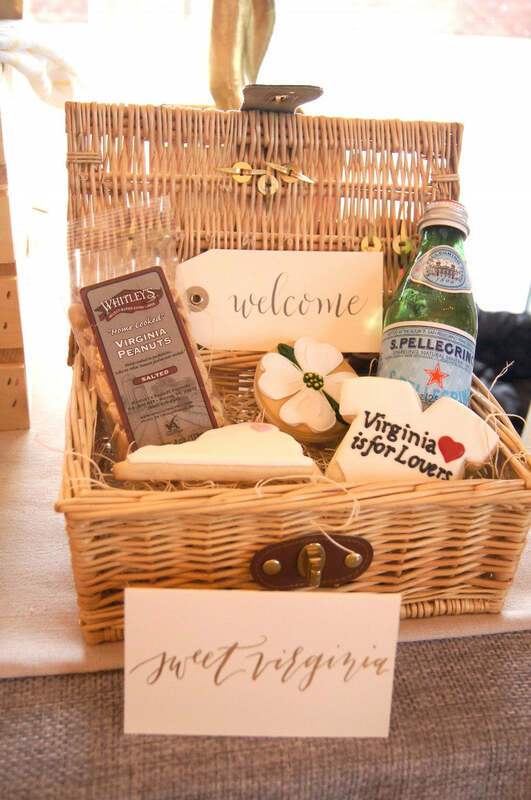 In keeping with the 'Bowties & Bubbly' theme, I chose bubbly-related keepsakes and goodies inside the swag bags in addition to locally-inspired Maryland items. 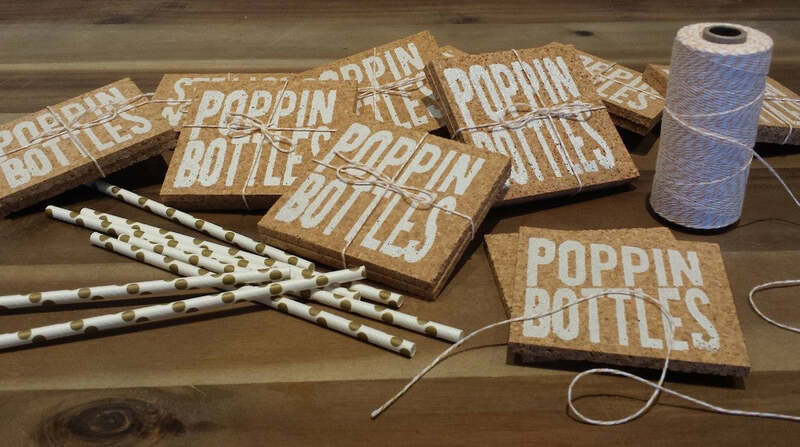 Examples include "Poppin Bottles" cork coasters, Sugarfina Champagne Bears Gummies, Sofia Sparkling Wine, a crab mallet, and even a mini crab cookie cutter! 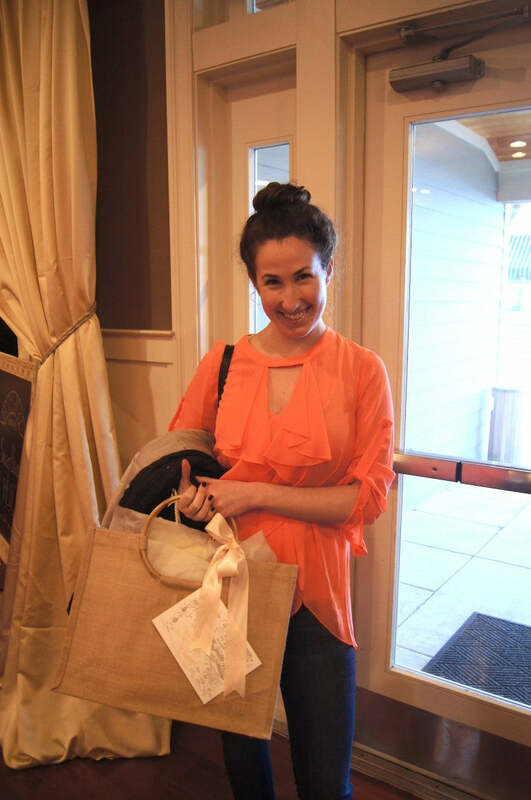 The bag itself was a deluxe jute tote with beautiful round bamboo handles. 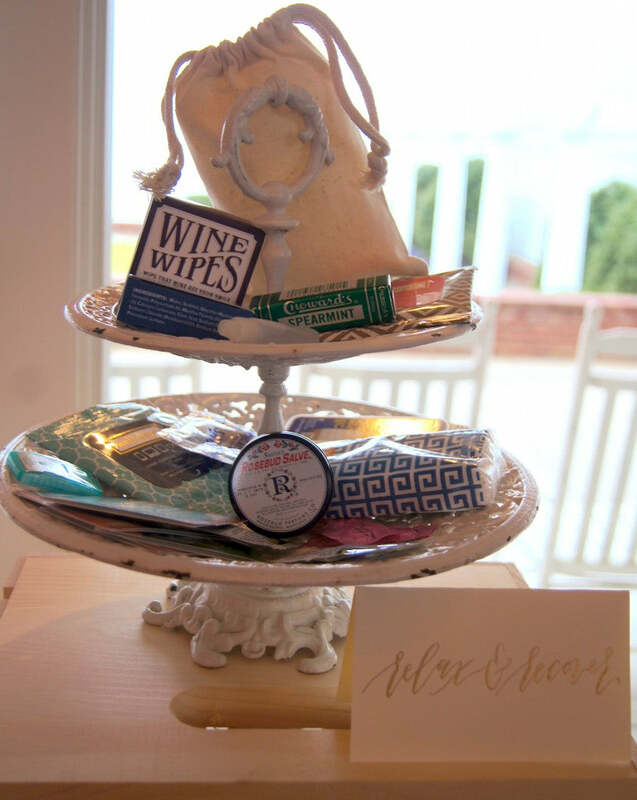 It's definitely something the brides-to-be can use again and again! 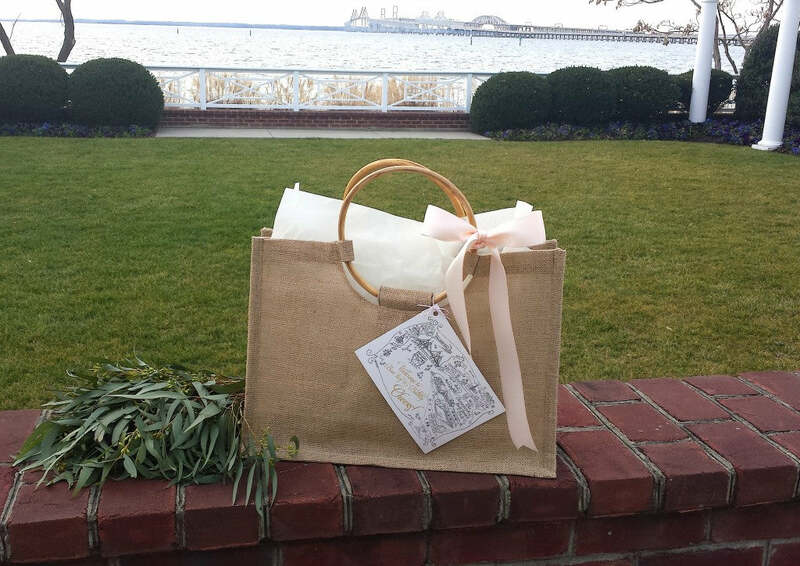 The hand-drawn maps were a beautiful addition to the outside of the bag, done by local Cink Art. Now, for a little behind-the scenes! I spent several days at CBBC assembling the bags. 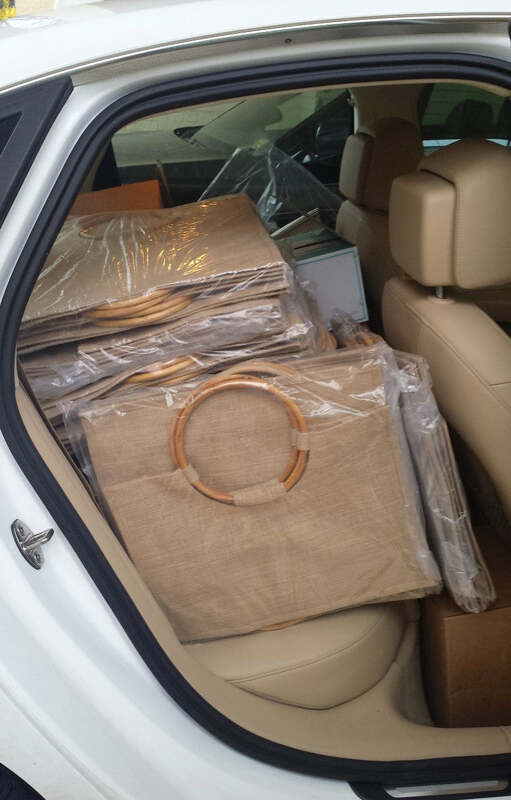 Two hundred tote bags and two hundred of each item to go inside...next time I need an SUV! As soon as I pulled up on the first day, the club offered their assistance. Look! They even had carts ready and helped me unload my jam-packed car. We had an old-fashioned assembly line going on. 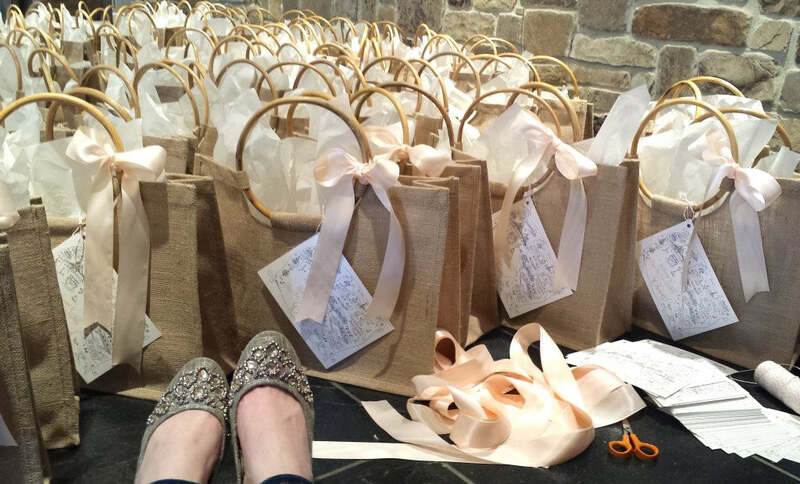 Lots of bag stuffing, ribbon tying, and tissue paper fluffing! 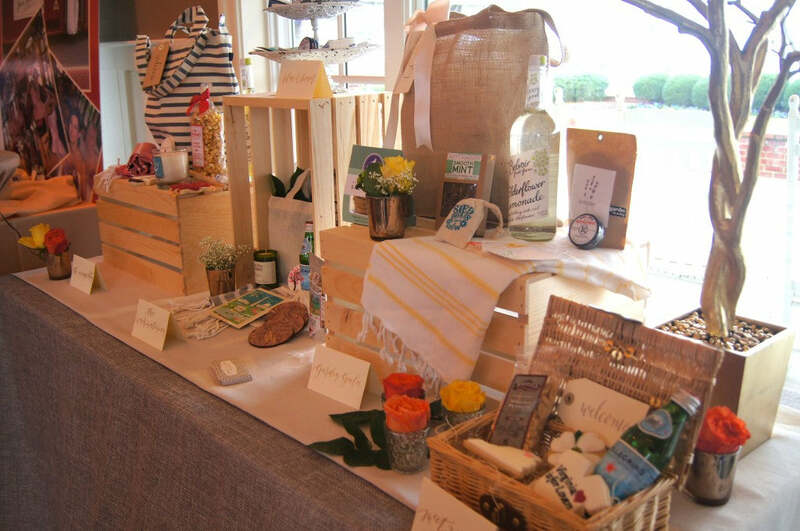 It was a festive atmosphere as everyone shared in the excitement of knowing how elated the brides would be when they received their swag. 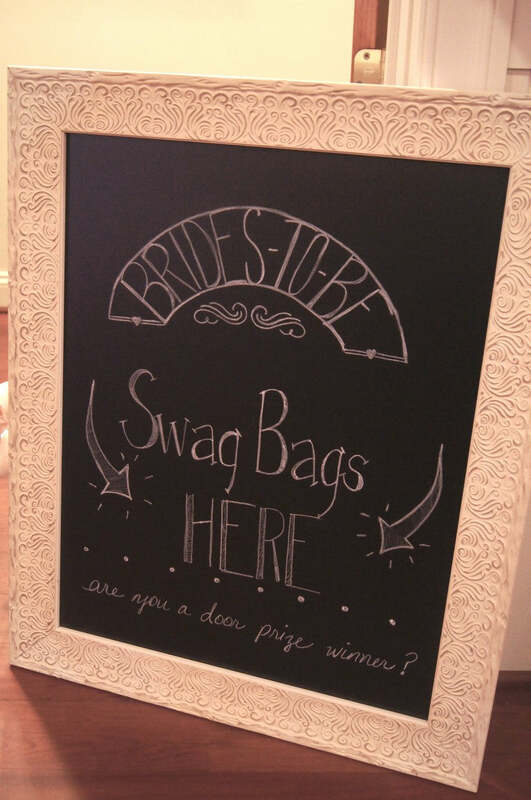 At the end of the show, the brides visited the bridal suite to collect their swag bags. 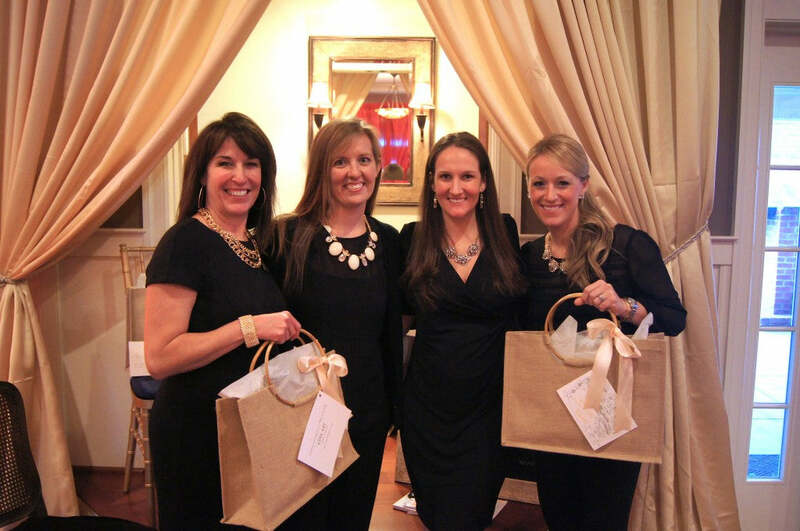 The club had staff, all dressed up in black dresses and sparkly necklaces, specially assigned to hand out the swag. Such a nice touch! 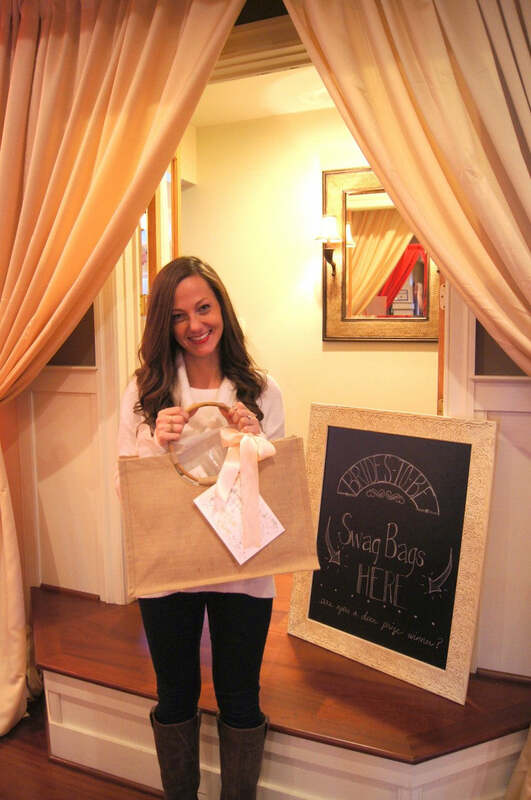 Such a rewarding feeling seeing the brides collect their swag bags from the bridal suite! All smiles. 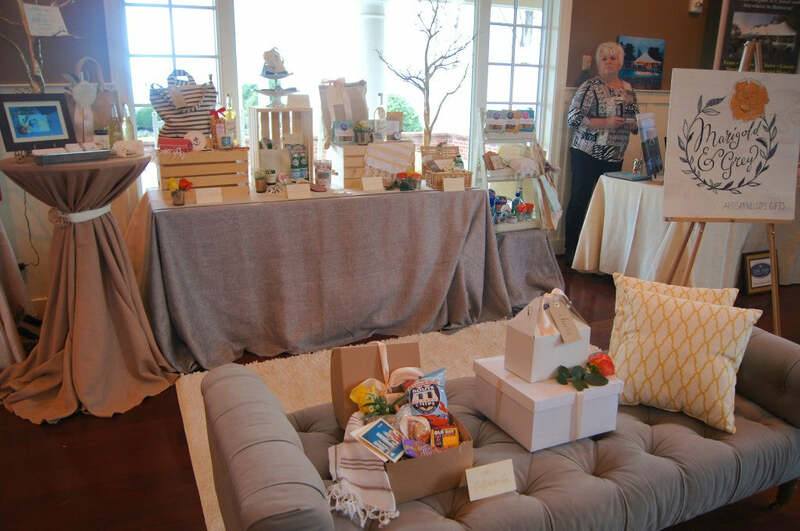 Each room at Chesapeake Bay Beach Club was assigned to a separate design team and group of vendors for florals, paper goods, linens, furniture rentals etc. This year, a separate photoshoot took place in each room the day prior to the actual show to capture each team's unique vision. I was asked to design a welcome gift for each room to be photographed as part of the shoot. So honored! 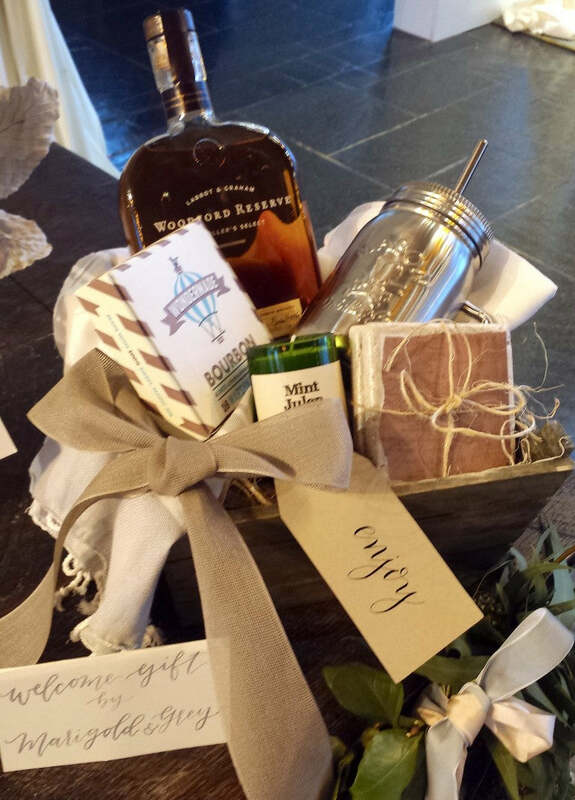 Next, a bourbon themed welcome for the Kari Rider Events and Crimson & Clover floral design team. Kari displayed the gift on her bourbon bar display. So fun! Next, a super fun design for Lemon & Lime Events! I typically work in mostly neutrals and soft tones, it felt great to experiment with bright colors! Definitely the most fun gift I've ever designed. 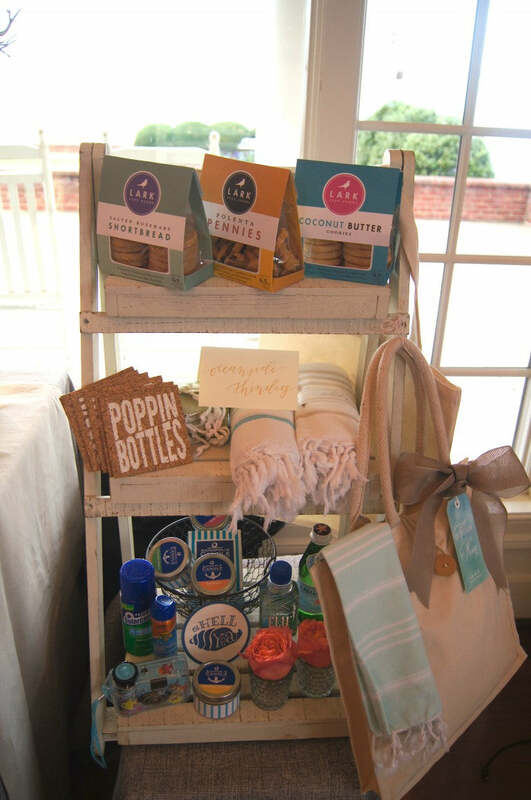 And last but not least, a boho beach welcome for Intrigue Designs and Engaging Affairs! 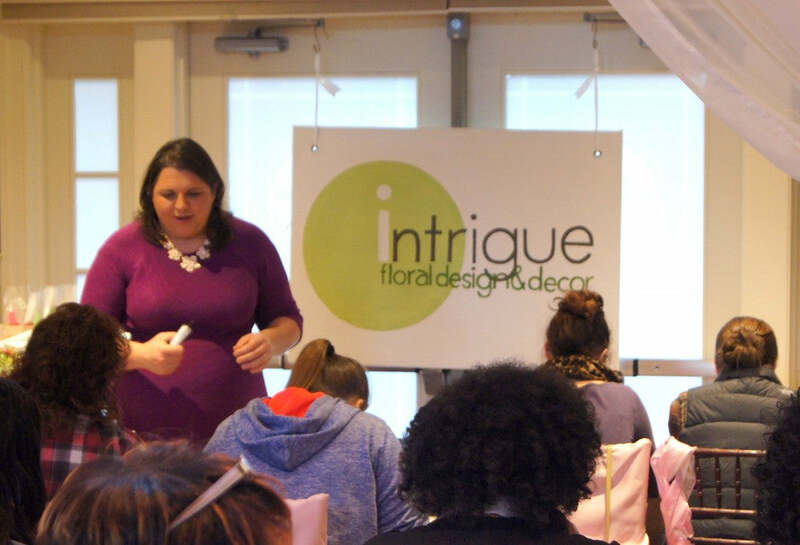 Since our booth was in this particular room, I had the opportunity to observe the floral crown class being taught by Sarah Campbell, owner of Intrigue Designs. 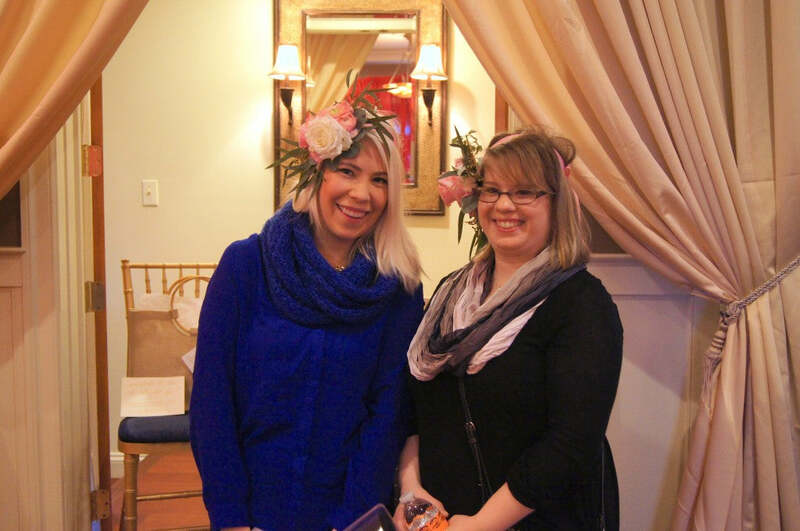 Tons of gorgeous crowns made and much fun had by all! And the finished product...a beautiful crown and a smiling bride! Thank you Chesapeake Bay Beach Club for the opportunity of a lifetime! Creating custom client gifts is one of the many perks of my job - hop over here to learn more about the process!